9th March 2014 – After three days of intense competition in Sopot, Poland, the nine PACE athletes at the IAAF World Indoor T&F Championships returned home with three medals, some personal and season bests, but most of all many solid platforms on which to build successful 2014 summer campaigns. 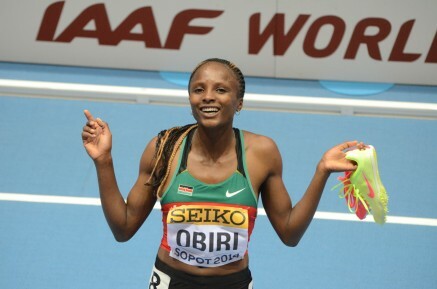 Hellen Obiri (KEN) completed her own individual set of World Championship medals as this time she took silver in the 3000m. That adds to the 1500m bronze she won at last years World outdoor championships and the gold she took when winning this title 2 years ago. Shannon Rowbury (USA) ran an assured heat and placed 8th in the final. Andrew Osagie (GBR) once again performed in the championship arena as he progressed through a tough round of qualifying in the men’s 800m before finishing 4th in a high standard final. He was later upgraded to the bronze medal after the disqualification of the Polish athlete, Lewandoski. This is Andrew’s second World Indoor bronze medal to add to his World Outdoor 5th place and Olympic Games 8th place. Jeremiah Mutai (KEN) gave himself every chance of qualification with a brave piece of front running in the heats but just missed on a fastest loser spot. The current World outdoor individual 400m champion Christine Ohuruogu (GBR) joined her British teammates in both the heats and final of the 4 x 400m relay. Although not quite able to defend their title from 2 years ago the team did take the Bronze medal. Ending a successful indoor campaign which has seen him break 2 American Indoor Records, Galen Rupp (USA) was just run out of the medals in the men’s 3000m. After a pedestrian early pace the race really picked up over the final 1000m with Galen closing in 4th. After another consistent indoor season Bethwel Birgen (KEN) was pleased to make his first World Championship Final but in a very tight race he could not get the run he wanted as he took 8th. Kimmari Roach (JAM) was another athlete making his fist World Final, running 6.58 seconds in the 60m for 8th having run a new indoor PB of 6.55 seconds in his semi-final. Finally, making a welcome return to the major championship stage, Jemma Simpson (GBR) was just outside her seasons best in the women’s 1500m.